Find hotel near Parroquia De San Jaime Y .. The Iglesia de San Jaime y Santa Ana is a Catholic church that dates back to the 18th century after an image of the Virgin of the Suffrage (Mare de Déu del Sofratge) was found at the beach on a ship in 1740. The image was on a boat that floated here from London without a trace of the ship’s crew! When the locals in Benidorm decided to burn the ship thinking it carried bad luck, they found the image of Virgin Mary with infant Jesus in her arms in the ashes. Today, the image forms the main alter at the Iglesia de San Jaime y Santa Ana. Take a walk around to see the gorgeous image and to see the neo-classic architecture of the church. The Latin cross plan with the side chapels and the central nave have become iconic to this place. Even though its exteriors are rather minimal with white walls, the blue tiles of the domes of the church and the chapel, light up its interiors. The church is most famous for hosting festivals like Festes Majors Patronals and the Festival of Sant Jaume and Santa Ana while on any other day, the view of the Mediterranean sea and the beach from the entrance, is enough to pull you to its doors! How popular is Parroquia De San Jaime Y Santa Ana? People normally club together Levante Beach and Poniente Beach while planning their visit to Parroquia De San Jaime Y Santa Ana. Beautiful area of Benidorm where Street musicians play, people sit, wander around and take pictures. The church is beautiful inside a very pleasant suprise. There are restaurants available to enjoy a drink and something to eat. Worth a visit. 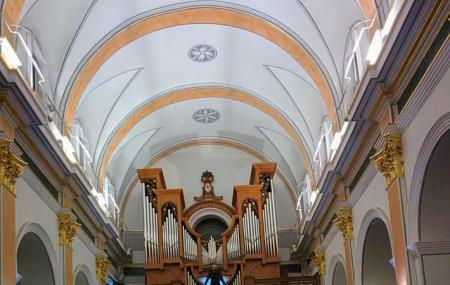 A beautiful church in the old town of Benidorm. Beautiful views of the sea... worth the hike up the hill!